It's been a long time since I started supporting Chelsea and an even longer time when I became a football fan (thanks to the Brazilian Ronaldo with the triangular patch of hair) and there have been times that have been etched into my memory. Here are a few of those. John Terry was dragged to court by Anton Ferdinand for a racist dialog. 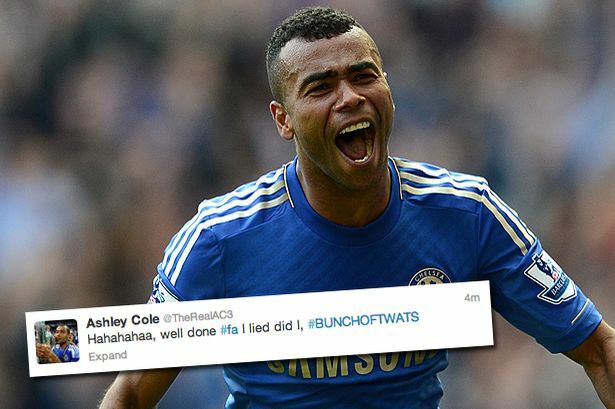 Ashley Cole was a witness and the court cleared him of charges. The FA, however, jumped in and handed Terry a fine and a ban. This is what Ashley Cole had to say in his Twitter account. It wasn't certainly a proud moment, but an insanely funny one for the fans. Cole deleted the tweet and escaped with just a fine, when many predicted it could end his England career! So much for being the world's best left back. 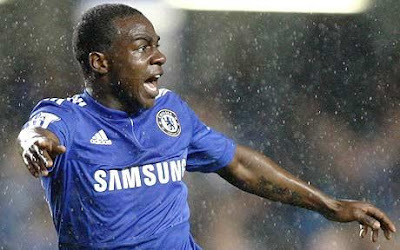 Gaël Kakuta was the next best prodigy in European football when he joined Chelsea in 2007, but a transfer ban was imposed on Chelsea for three transfer windows due to Kakuta's breach of contract. Although the then manage Ancelotti remained cool about it, Chelsea started extending contracts of a lot of players. Although the ban wasn't enforced as Chelsea appealed, they didn't buy anyone in the January transfer window of the double winning season. However, the ban was lifted in February that year, as Kakuta apparently, didn't have a valid contract with Lens. Chelsea supporters all round the globe breathed a sigh of relief! Three years on, Kakuta is a talent long lost in Chelsea's abyss of emerging stars! January 31st, 2011 will be a day hardly any Chelsea supporter could forget. It was the day Abramovich decided to splash the cash once again, letting go of £50 million for Fernando Torres and a good part of about £25 million (and Nemanja Matic) for David Luiz. Although Torres didn't turn out to be a fraction of what he was expected to be, it was a great a day nonetheless for a supporter- Chelsea were back in the transfer market with a bang. 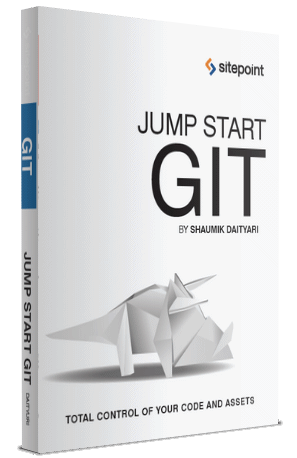 I have written detailed blog posts on this topic about a year ago, but let me tell you a gist. 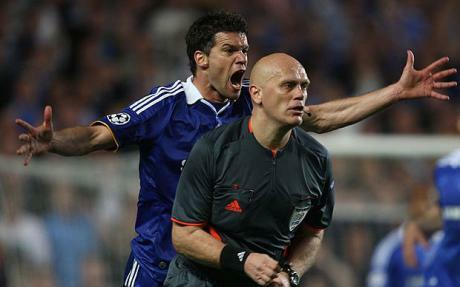 In the 2009 CL semi final, Chelsea fought hard for a 0-0 draw at Camp Nou in the first leg. In the return leg at Stamford Bridge, Chelsea were leading 1-0 until deep in extra time when Iniesta came up with a wonder strike. What made matters worse is that FIVE clear penalty calls by Chelsea were denied in the dying minutes (detailed post here). Three years later, Chelsea were drawn again with Barcelona in the semi finals. This time, however, against all odds and with no cheating involved, Chelsea defeated Barcelona fair and square with resilient defending, which involved making the score 2-2 after being 2-0 down with ten men (detailed post here)! Chelsea were drawn against Inter in the round of 16 in CL 09-10 (around the same time they were fighting against the transfer ban). Although Ancelotti's Chelsea were tipped to win the tie, Inter had other plans. The first leg at San Siro started with a Diego Milito goal in the 4th minute due to a Terry blunder, followed by a mysterious injury to Cech. Kalou got the scores level, but Cambiasso got the winner soon. Mourinho then went on to say- "I have never lost at Stamford Bridge!" That was the moment I hated him. Chelsea went on to lose the return leg 1-0 due to a late Samuel Eto'o goal. Eto'o had mentioned that Mourinho had taught him how to score against Cheslea! Drogba was sent off, and I know Mourinho had a big role to play in making Motta look like a genius. My first season as a Chelsea fan and what better finale could you think of? Chelsea hosted United at the Bridge knowing a win would seal off the title. Willam Gallas's clinical header gave Chelsea an early lead, Joe Cole added a brilliant goal before Ricardo Carvalho did a Joe Cole. 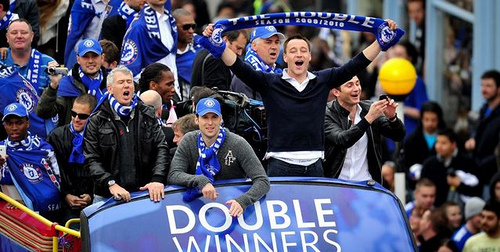 Chelsea won 3-0 to wrap up back to back Premier League titles. What's better is that just before the match, Ferguson said that his side was as good as the one which won the Treble in 1999! The Guardian called it blind faith. Ancelotti came to Chelsea as a double CL winner with AC Milan, having won the cup as a player too. Naturally, his prime target was Europe, where he was unlucky with numerous injuries to key players against Inter, but he did more than enough to compensate in the domestic tournaments. Ancelotti's so called 'ageing' squad thumped in over a hundred goals in the Premier League, the first time a team had done that. Drogba got the Golden Boot and it was a great home season for Chelsea, the only setback being a loss in penalties in the League Cup against Blackburn. Chelsea also became the first team ever since the Premier League started to defeat Arsenal, Liverpool and Manchester United in both home and away games in the single league season. What more can I say? I guess the man speaks for himself. Yes, it still hurts. 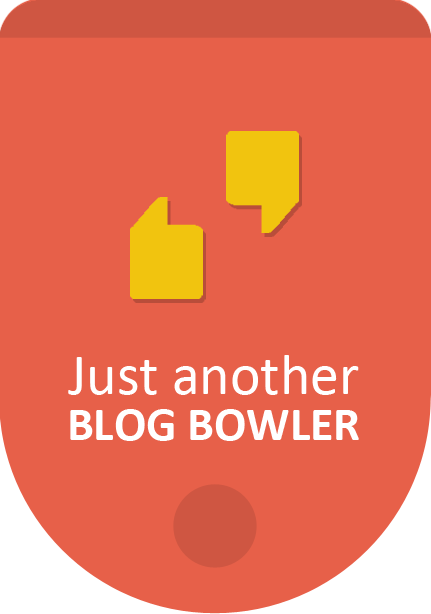 Drogba's slap on Vidic, Anelka's penalty miss, Terry's slip! It still haunts me. I stayed up till 3.10 AM at night watching that match and it hurt as I switched off the TV to avoid the celebrations. It was also Makelele's last match for Chelsea. I don't want to put any pictures of that match- because it still hurts. With each passing minute, Bayern Munich misses in the CL final of 2012 made Chelsea grow in confidence. However, in the 82nd minute, Tomas Muller headed home and it seemed curtains for Chelsea. I couldn't come back to my senses until Torres came on for an unconvincing Kalou. Then Torres won a corner, Mata took it. And BANG. Drogba's header had so much power that Neuer, considered one of the world's best, couldn't stop it even when he got to it! The rest of the match was great. But that was the moment- the greatest moment as a Chelsea supporter.